Peruvians joke that you need a different passport to enter Arequipa, Peru’s second largest city. While in Lima, we heard this joke a couple of times and it was often made in the context of Arequipa dishes. We learned that although Arequipa is only about one-tenth of the size of Lima, the capital, it is equal in terms of cuisine, historical significance, confidence and pride. Arequipa is located about 600 miles south of Lima and is the 3rd most visited city in Peru after Cusco and Lima. Arequipa dishes are integral to Peru’s gastronomy and often a source of rivalry between Limeños (people from Lima) and Arequipeños (people from Arequipa). Once we heard about the gastronomy rivalry between Lima and Arequipa, we were immediately intrigued. On our way up to Lima from Cusco, we had actually stopped in Arequipa to change buses, but did not have a chance to stay and visit the city. We had heard about the local specialties while in Cusco and upon hearing about the rivalry, we knew we could not miss out on the food from Arequipa. 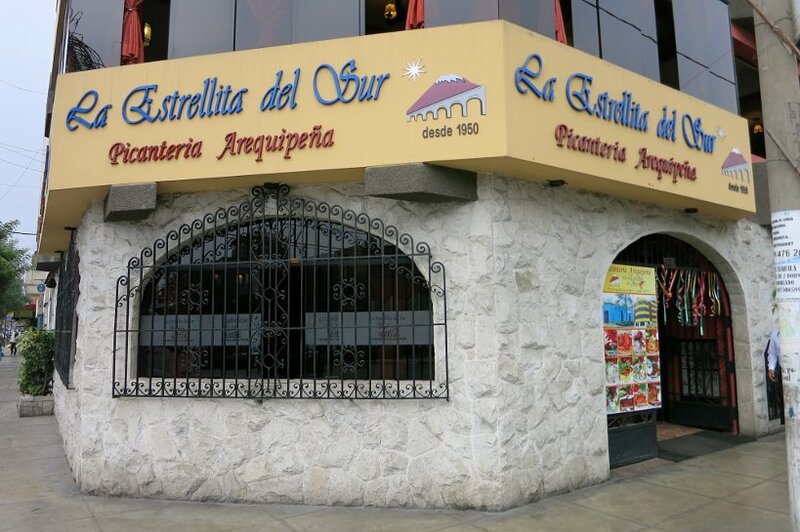 Even though we didn’t have a chance to visit Arequipa, we were able to experience the authentic specialities at La Estrellita del Sur one of the oldest Picanterias in Lima. A picanteria is a traditional eatery usually in Arequipa devoted to serving Arequipa dishes. They are not fancy establishments, but the ideal spots to sample what the region has to offer. The tradition of the picanterías is to only serve certain dishes on certain days. For example on Monday they serve Chaque de Tripas (Tripe Soup), on Tuesday Chairo (meat, vegetable and potato stew). Chupe de Camarones (Shrimp chowder) on Saturday and the Sunday adobo pork (stew made from pork, chicha and rocoto peppers) are normally reserved for weekends. Picanterias are typically lunch only places with regional musical groups or singers. With the company of Patricia, our Airbnb host, we went to La Estrellita del Sur on a Friday afternoon eager to discover the remarkable Arequipa dishes. As we waiting for our meal, Patricia, who is from Lima shared stories with us about the Arequipenos and their pride. The rivalry between Lima and Arequipa exists so much so that Arequipa has continuously attempted to gain independence from Lima and create the “Independent Republic of Arequipa”. 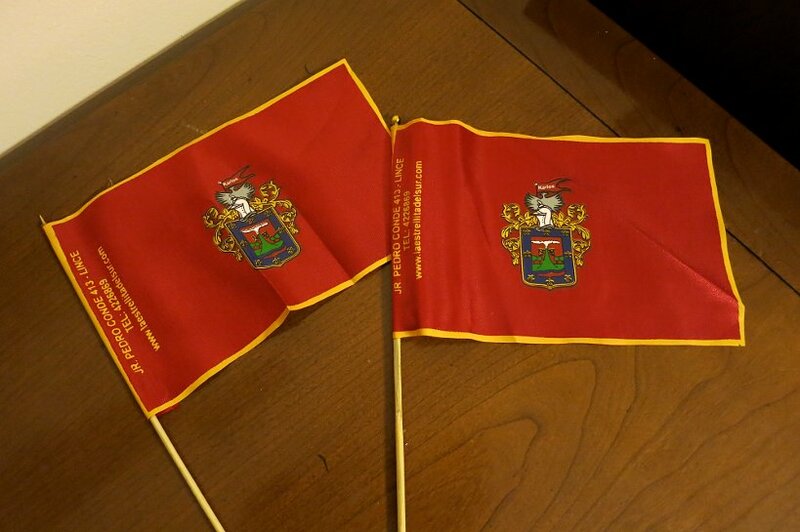 What’s interesting about this is the fact that Arequipa does have its own flag and national anthem. Getting back to the food! We highlight here the two famous traditional dishes, two beverages and the most famous dessert from Arequipa. One funny side note is that during the course of our meal, the servers brought us Arequipa flags, underscoring the pride of the Ariquipeños. Rocoto Relleno is the emblematic dish of Arequipa. Our first encounter with Rocoto Relleno was in Chinchero at the local market. When we tried it then, it was a side dish to the local specialty trucha (trout). Already we were surprised by its flavor and spiciness. This time at La Estrellita del Sur Picanteria in Lima, we ordered Rocoto Relleno as a primary dish. The Rocoto Relleno are stuffed spicy peppers same size, shape and color as a red peppers. The top is cut to stuff the peppers and used as a “cover”. They are prepared without the seeds and veins, and then boiled in salt and vinegar, all of this to soften the spice. The stuffing is made of chopped meat, onions, garlic, raisins, olives, cheese, various spices and sometime hard boiled eggs. 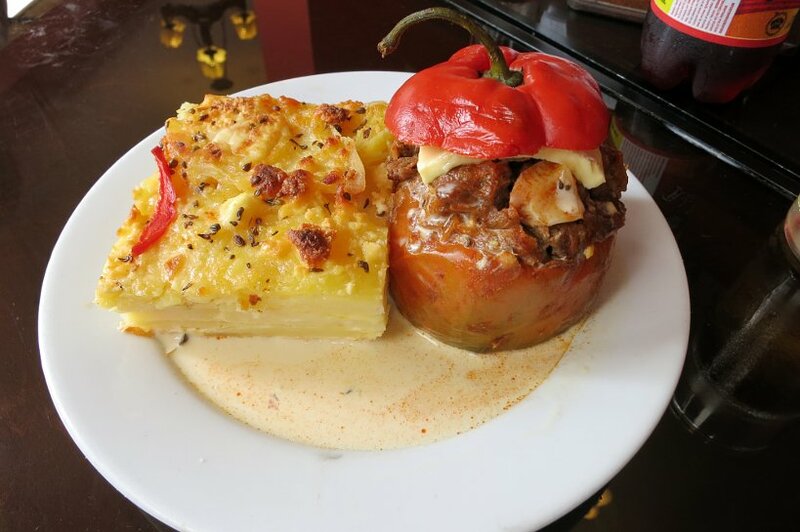 The Rocoto Relleno came served with pastel de papa which is similar to a gratin dauphinois in France or potatoes-cheese cake. 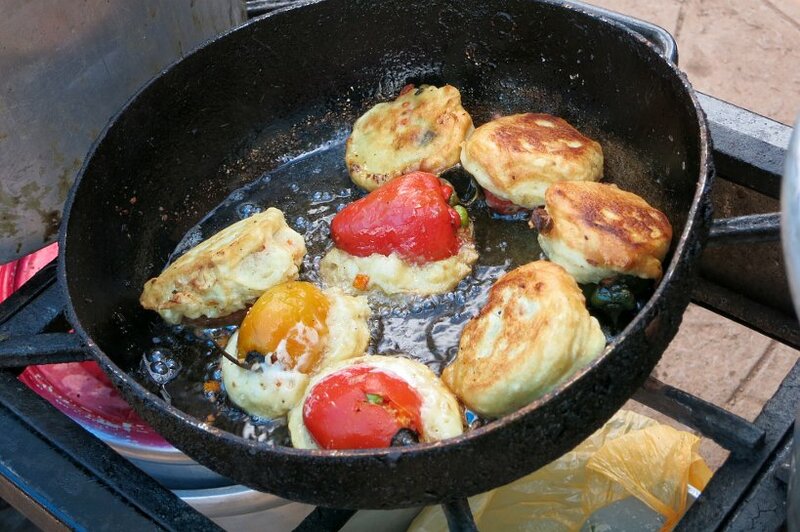 It is really a perfect combination as the potatoes soften the spice of the peppers. 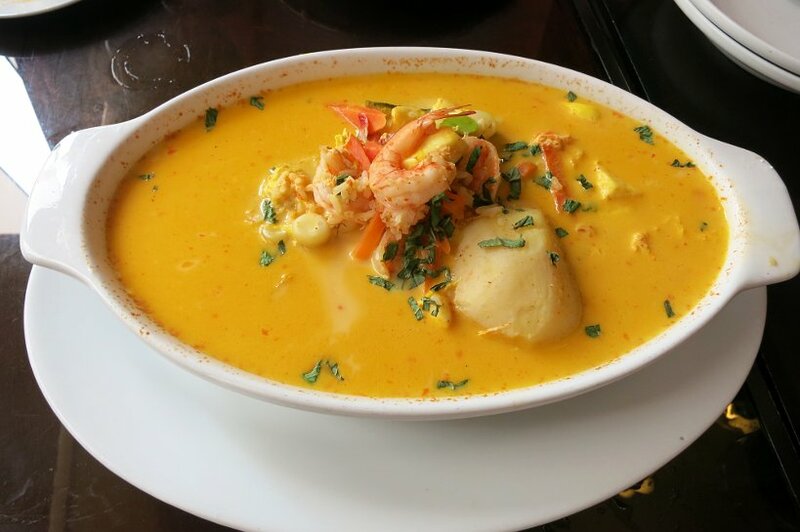 It is really a great dish and one not to miss while in Peru. 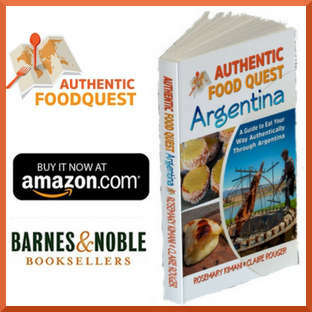 Although it is from Arequipa region, you can find it served across the country. 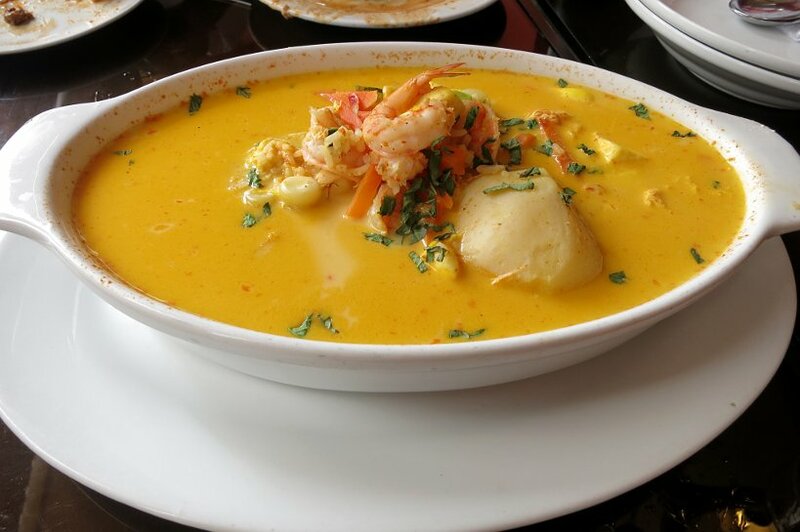 Another one of the famous Arequipa dishes is the chupe de camarones. The most striking thing about the dish was the large bowl and serving. Fortunately, our host Patricia anticipated the serving sizes and wisely recommended that we share the dish. This hearty soup is one of the best soups I have ever tasted. The bowl was filled with lots of shrimp, potatoes, squash, rice, beans, carrots, corn milk, eggs, salt and huacatay (local aromatic herbs). With the huge shrimps and exquisite tastes this is an explosion of flavors and textures in the mouth. Incredibly tasty and filling, this soup needs to be experienced. 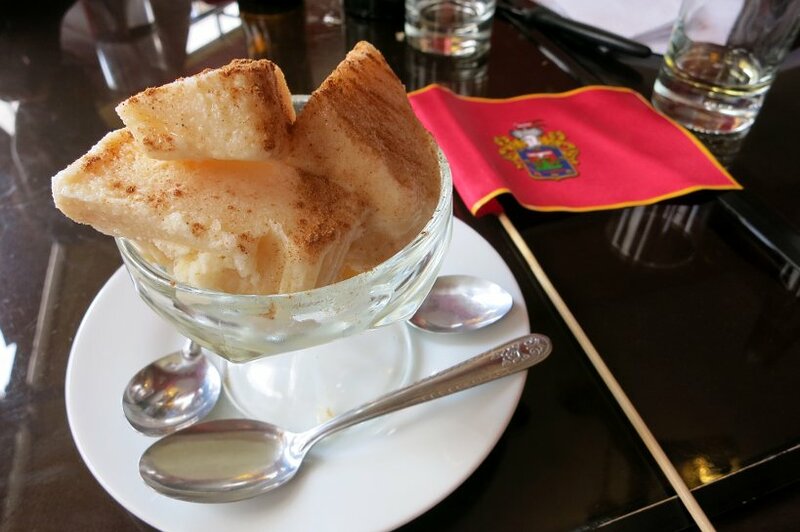 As we looked over the menu at La Estrellita del Sur, we were very intrigued by this desert called Queso helado. It literally means cheese ice-cream. Although there is no cheese in it! Made of sweet milk and coconut and cinnamon, this ice-cream is sweet and icy. It is like chewing on a sweet milk sorbet. The name comes from its traditional preparation which makes this dessert look more like sliced cheese rather than a scoop of ice-cream. Arequipa is known to be the birthplace of this artisanal ice-cream and it is one of its most famous dessert. 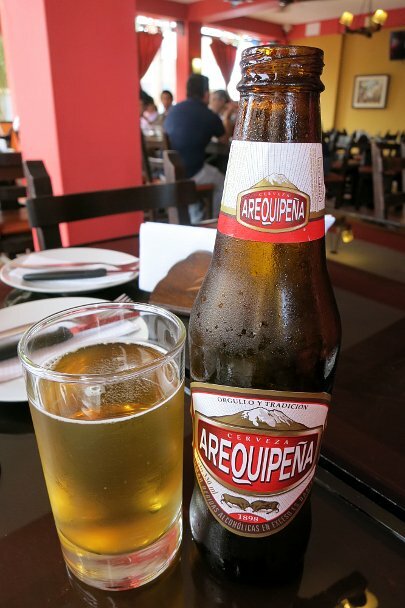 To accompany our Arequipa dishes, we chose two local beverages from the region. Claire chose the local beer called Arequipena. It is a pale lager beer. Claire found it a bit too hoppy and didn’t really enjoy its distinct taste. 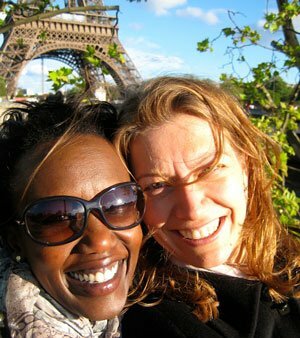 Nevertheless, she found it easy to drink. The drink I chose is a local soft drink called Kola Escocesa. It is a fruity soda but not excessively sweet and does not contain caffeine. It is made of natural mineral water from the company’s own source. According to the company website, it is an excellent accompaniment to any type of food including spicy food. This is due to its mineral components and its bicarbonates making it a highly digestive drink. 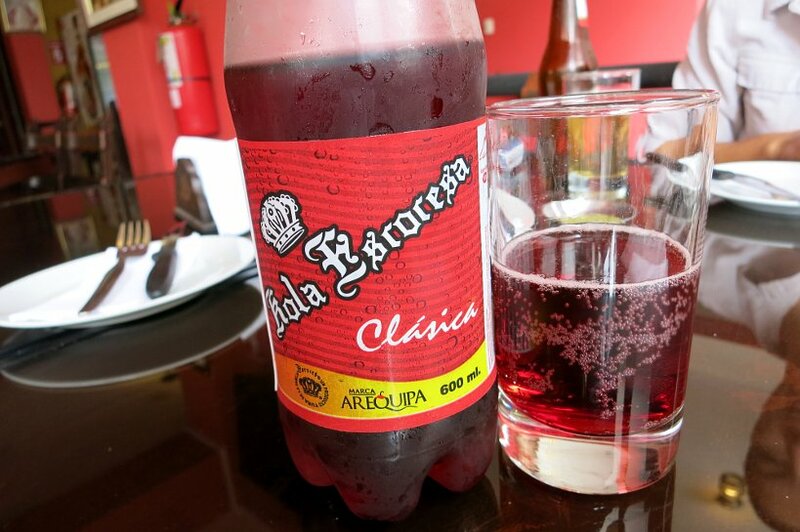 What a perfect beverage to go with the dishes of Arequipa! The diversity of the cuisine in Peru continues to be an amazing culinary adventure. 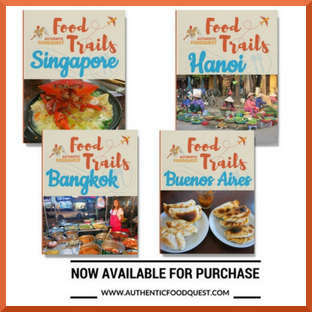 We are consistently blown away each time we taste the the local specialities from the different regions. The experience at the picanteria is one of the most unique experiences we’ve had. You get the distinct sense of the Arequipa pride in the decor, flags, music and traditional dress. 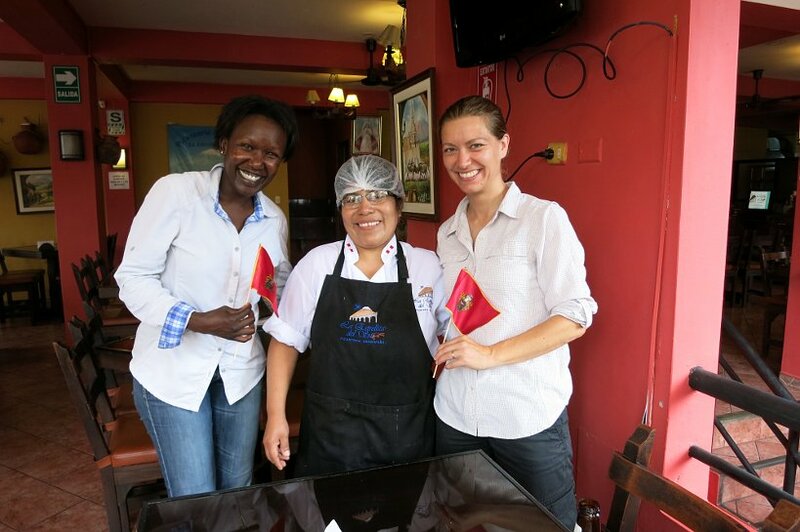 We also had a chance to meet with the chef Herlinda and she shared her love for Arequipa dishes with us. The food is generally known to be spicy, with picante referring to “spicy food” in English, though you can choose not to have any spices in your Arequipa dishes. Having experienced the traditional dishes from Arequipa, we would encourage you to give them a try. If you can’t get to Arequipa, do make the point of visiting a picanteria in Lima for the real experience. When else you be able to say you have had Queso Helado or cheese ice cream? La Estrellita del Sur, Esquina Jr. Pedro Conde y la Av. Ignacio Merino, Lince, Lima. OMG, I’ve always wanted to visit Peru, but now I have to move it a few more notches on my bucket list. 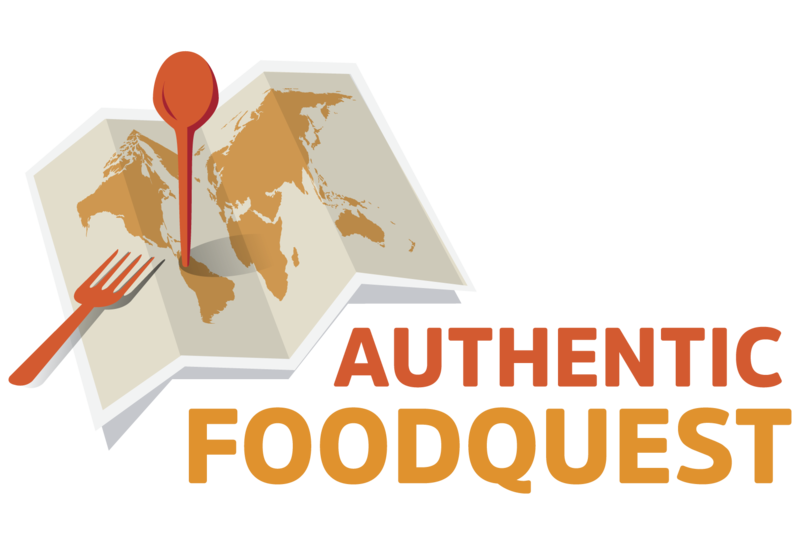 I just did a post on food destinations of the world and may have to update it soon to include both locations representing Peru. Those dishes look amazing! 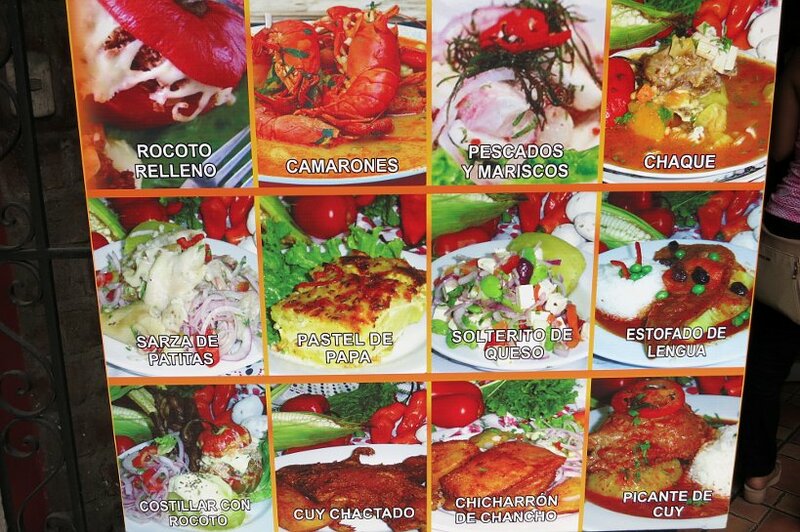 I confess I had never really heard of this part of Peru, but the food looks fantastic. what a great visit and that shrimp chowder looks fantastic! Very interesting dishes! Both chupe de camarones and queso helado look very mush to my liking! 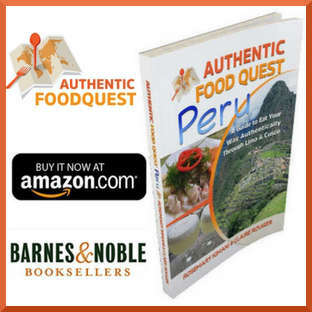 Peru looks like a fabulous food experience! Thanks so much for your comments. The food in Peru is incredible. The diverse landscapes, climates and cultures makes for a rich and delicious gastronomy experience. A must! 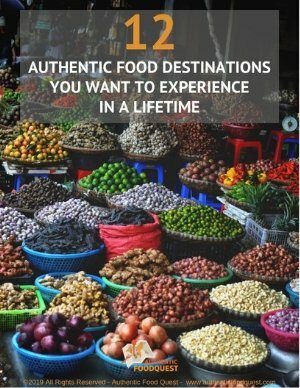 Thanks for sharing – Peru is a place I never really associated with great food, but after reading your post it has shot up quite a few rankings! oHHH Wowwww!!! What an amazing stuff!! I am getting mad of trying them its such a colouful and lovely cuisine.. One should try this once in a life time.. Thanks for sharing such a lovely post for a foodieee like meeee!! Hi Nick, you are so welcome. Glad you enjoyed learning about the specialities from the South of Peru. The colors of the dishes are indeed bright and fun. Thanks so much for your comments! i am literally drooling after reading your post. 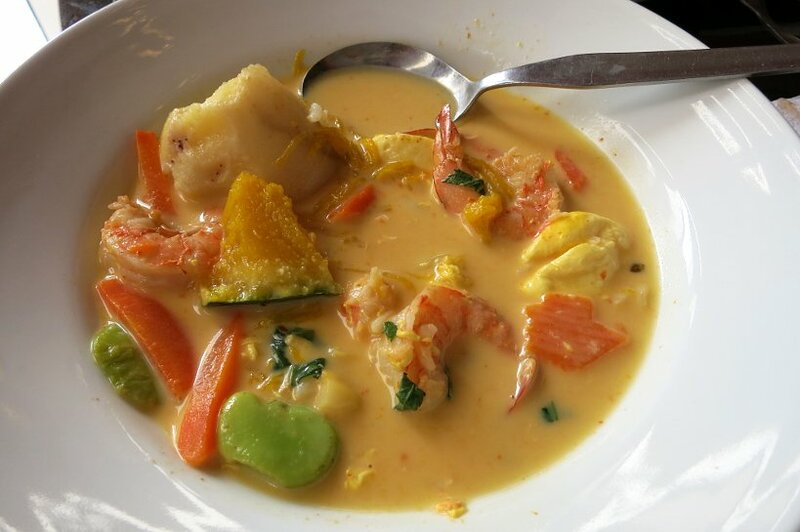 I have been to many places in Europe and i have tasted different cuisines as well, but here in Peru it looks completely different, the color, the dishes gives different meaning to food, My next trip would be to Peru, yay! Awesome Jerry, that’s wonderful to hear. 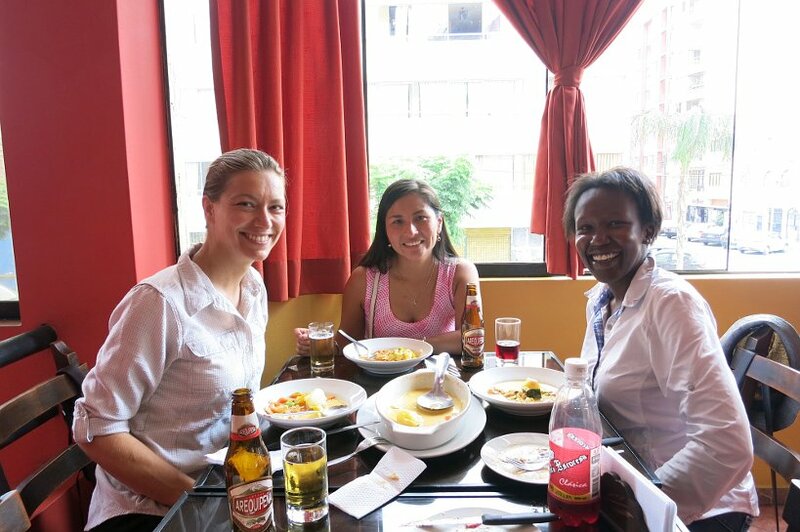 The food in Peru is outstanding…in fact, Lima is said to be the gastronomy capital of South America. So much good stuff to experience. Hope you get to Peru soon. You will love it 🙂 Cheers! I am very foody and love your dishes .Thanks for sharing !!! This page is very awesome for foodies as like me and the flavours which are descibed are exotic with such a simple way to make them and the plating by god very awesomely displayed.